When you’re tangled up, just tango on (according to Lt. Colonel Slade on one of my all-time favorite films, “Scent of a Woman”). This is what I’ll be attempting to do this weekend as I untangle the remaining files on my desk! We did manage to hit the nursery yesterday and brought home some beautiful violas and pansies, some of whom will be playing guest-starring roles as I paint their little faces in watercolor (or at least, try to lol). I used three shades of green Inktense watercolor pencils to make this little painting. I love watching warm and cool shades of the same color duke it out on the page. I don’t seem to be happy when everything blends so perfectly. There’s gotta be some renegade hues to zing things up a bit! Happy Easter Weekend to you!! Lovely zingy piece here! Thanks! 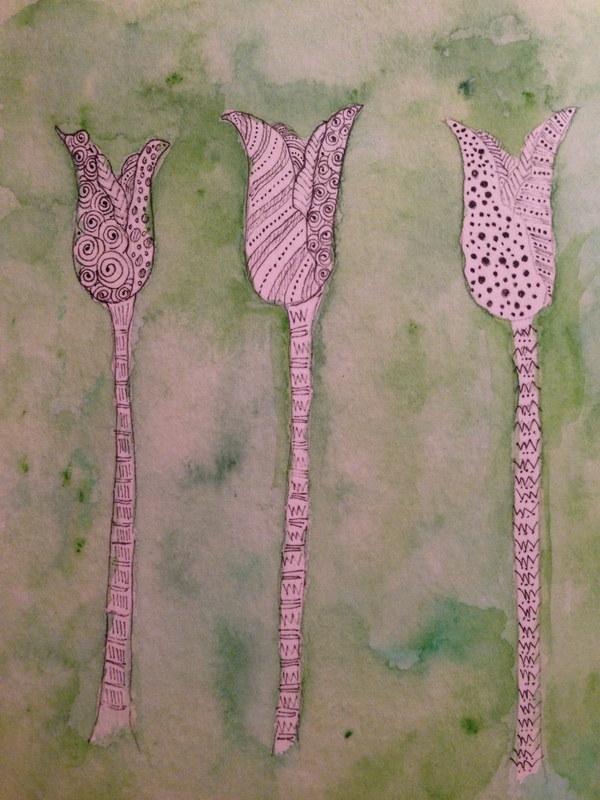 I drew the tulips first, and tangled them, then I wet the paper everywhere but on the tulips so that when I added the paint, it would flow only to the wet areas. It was a bit easier, since I used the inktense pencils vs. really wet tube color. very creative Rebecca and very nicely done! Happy Easter to you! I really like all the elements of this piece: color, contrast, patterns, and media- great Easter post!